Katadyn BeFree 0.6L Water Filtration System. This review doesn't discuss specific data such as weight, flow-rate or length. I'll leave that to the manufacturer and other retail websites. This review only describes my own experience with the device as well as some things I learned before, during and after its use. Easy to fill, easy to use, and collapsible. Over the years, I have used quite a few different water filtration systems. I've also given up on some of the more complex filtration products after reading their rather extensive product documentation, never even using them once due to their complicated instructions for use. The actual water filter sits inside the bottle top just under the mouthpiece. When I'm in the backcountry, I don't want to have to remember 253 steps on "how to make your water safe for drinking". Usually, I don't need the filter for car camping trips. The times I had to rely on a backcountry water filtration system were usually during organized trail ultra marathons, where time was of the essence and during self-supported solo adventures, where there was no access to any outside assistance or any safe drinking water that was readily available. The bottle cap meant to prevent spillage is attached by a small plastic hinge. When you first start looking for a water treatment solution suitable for your needs (be it actual water filters or water purifiers), you will be surprised to find just how many different systems there are. There are pump water filters and purifiers, gravity filters and purifiers, Ultraviolet (UV) purifiers, bottle filters and purifiers, squeeze water filters, straw-style water filters, in-line water filters for hydration packs, chemical water treatment pills and good old fashioned boiling. There are many factors that can and should help you narrow down the appropriate choices to meet your specific needs. How often are you planning to use your system? What do you plan to use it for? Car camping? Multi-day back country hiking trip? Single day ultra marathon? Or maybe you plan to use it for a variety of activities? What are other important factors for you? Ease of use? Water taste? Filtration speed? Filter cost? Once you answer these questions for yourself, you should have a great starting spot on finding the perfect solution. As mentioned earlier, I've tried many different methods with varying degrees of success. That's not to say any of the tried methods didn't work, they did, but some worked better than others, faster than others and were less problem prone than others. For a while now, I'd been on the hunt for a quicker, easier solution. I've tried pumps, in-line filters, straw-style filters and chemical solutions. While all of them worked, none of them felt like a natural solution for me with the exception of the in-line filter for hydration bladders. However, I prefer bottles, so that was not a long term solution either. The straw-style filter (with a squeeze pouch) seemed like a great option, but it still required you to stop, scoop up water and then filter it into another bottle for actual use. Not quite as intuitive as I had hoped. Enter the Katadyn BeFree 0.6L Water Filtration System. One look at this solution and I was sold. I did some research online and bought it from one of the larger online retailers. In fact, I bought two. The BeFree looked like it was meant for ultra runners. It consisted of a collapsible soft flask very similar to the soft flasks currently being provided with the more popular running vests on the market, made by companies like Ultimate Direction and Salomon. The actual water filter sits inside the screw-on bottle top. Since my hydration running vest holds two bottles in the front, it just made sense to me to pick up two BeFree bottles. This setup was to be my way to get drinkable water during my attempt to cover the entire length of the 76 mile Foothills Trail between Table Rock State Park and Oconee State Park in the Carolinas in a single day or 24 hours. I am happy to report that it worked and performed perfectly, but there are a few lessons learned. As with any product, there is always room for improvement. 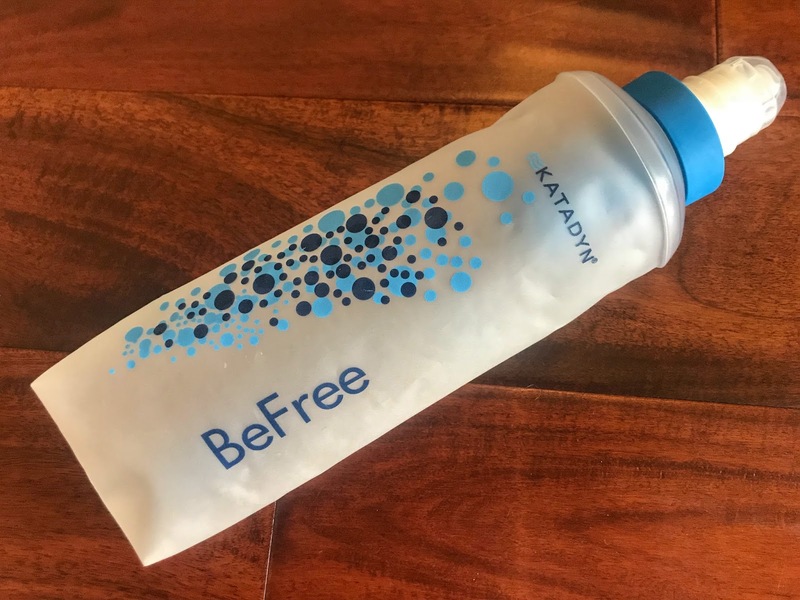 When the BeFree bottles first arrived, they seemed to be identical to the bottles that came with my Ultimate Direction running vest. Unfortunately, when I tried to place them inside the front pockets, I realized very quickly that the BeFree flasks were larger (0.6 liters) that the standard soft flasks (0.4-0.5 liters). Initially, this seemed like a dealbreaker to me, until I realized a fairly simple workaround. These are soft flasks and not filling up the bottles all the way allowed for enough compression to place them inside the front pockets of my hydration vest. 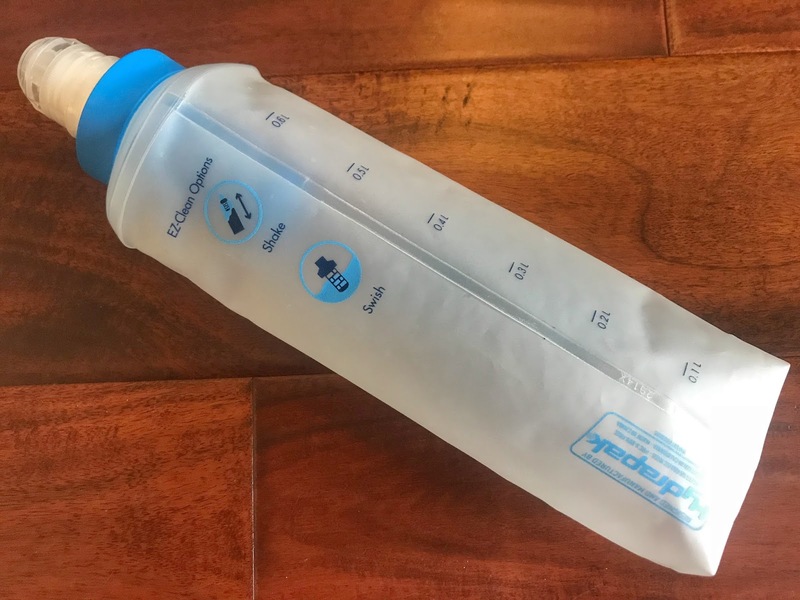 The perfect solution would be for Katadyn to produce a smaller bottle that fits the pockets of Ultimate Direction and similar hydration vests. I also noticed that while it appears that Katadyn uses the same soft flask manufacturer (Hydrapak) as many of the other outdoor gear makers, the filter did not fit on these other bottles to due a different thread. I would much prefer an interchangeable bottle filter or filters, one to fit widemouth bottles and one to fit the narrow top bottles. Since the technology lies within the filter and not the bottle, it would just make sense. One final item that could be improved upon is the actual water filter cap that prevents spillage. Currently, it is a small plastic cap identical to those of the single use "sports-style" water or sports drink bottles sold at your local convenience store. Their single largest "point of failure" is the tiny plastic hinge that keeps the cap attached to the filter. 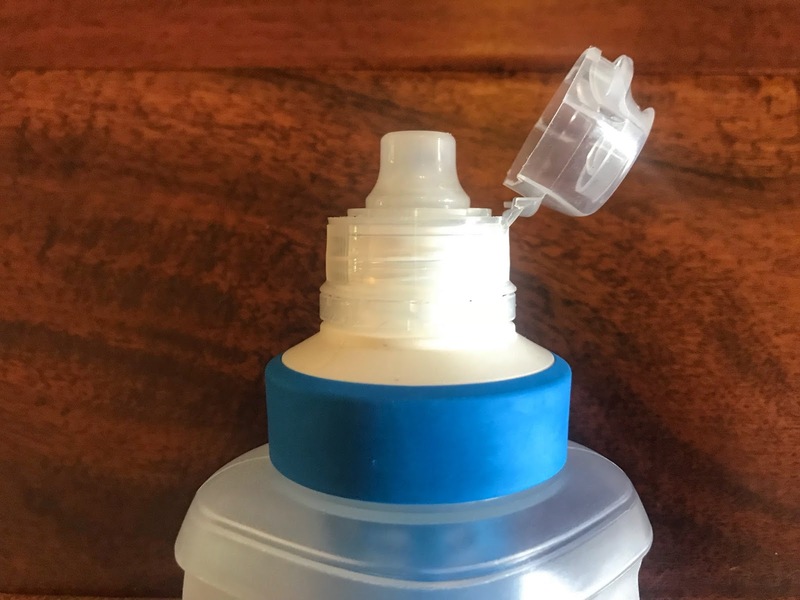 Should this little hinge break during use, one would no longer be able to prevent water from spilling out of the top of the bottle while hiking or running. Maybe a valve similar to other soft hydration flasks would be a better solution. Now on to the things that make this system the perfect ultra running back-country companion. First and most importantly, there is the ease of use. Twist bottle top (filter) off the soft flask, scoop up water from your natural water source, twist filter back onto bottle, stash bottle back into vest, drink at your leisure. You're back to running within seconds. Second, the flow speed is amazing. No sucking until your head turns purple. Instead, it's as easy to drink from this bottle as any other hydration flask. Or squeeze the bottle slightly as you drink to make it even easier. This is extremely important when you're exhausted already and/or are moving at speed. The last thing you want to do it catch your breath while trying to drink water, just because the flow rate is too low, preventing and keeping you from drinking water quickly. 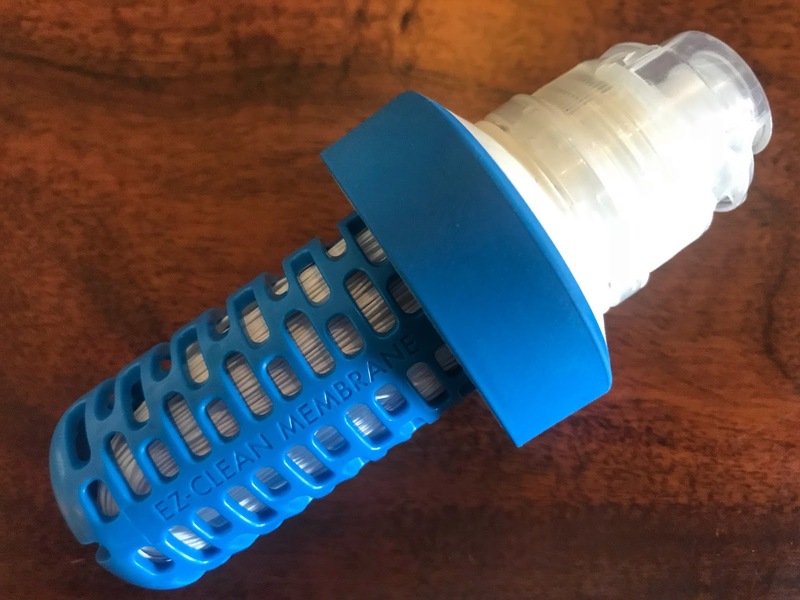 That's it, this filtration system simply works simply:-) It is currently the best solution out there for anyone trying to move quickly through the backcountry. Obviously, that applies to every ultra or trail runner out there during a self-supported solo adventure or similar organized event requiring participants to filter their own water along the way. Once Katadyn sorts out the issues I mention above, it will also be more than worth the current retail price tag of $39.95. I still consider this filtration system a "strong buy" as is as there is nothing even close to it currently available on the market.